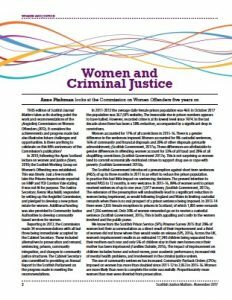 What progress has been made in Scottish justice five years on from the publication of the report of the Commission on Women Offenders (Angiolini)? Guest edited by Anne Pinkman, this issue focuses on women who have committed offences and justice in Scotland. Read on . . .
Buy your own magazine quality copy for $10.80 (about £8.00) from our MagCloud site. The copy should be delivered within about a week from placing the order. Download a complete .pdf of SJM13. Printing off is best done in colour. 7MB. For mobile and screen reading click the cover image or find all our previous editions on Issuu at http://issuu.com/scottishjusticematters. Paper copies may also be ordered from that site. The Pitfalls of Partnership Working: bureaucracy and innovation in criminal justice. Loraine Gelsthorpe, University of Cambridge, cautions about unintended consequences of a focus on sentencing women who offend and calls for a pause for thought. Shifting the Money: commissioning for equality and community justice. Barriers to Desistance: how the system gets in the way of women’s progress out of criminal justice. Linda de Caestecker, Director of Public Health for NHS Greater Glasgow and Clyde, was one of the three commissioners responsible for the ‘Angiolini report’. In this interview with guest editor Anne Pinkman, she considers what has been achieved and what remains to be done. Emma Trottier of Engender, considers the specific problem of accessing social security on leaving prison and questions of gender and social security more generally. RoseAnn Cameron writes as service manager of Routes Out Glasgow. Routes out of Prostitution: a continuing need. Sophie Humphreys introduces “Pause”: a new approach to women, trauma and pregnancy. Kirstin Abercrombie explains the new Glasgow bail project for women. Glasgow Women’s Supported Bail Service. Karyn McCluskey and Rose McConnachie of Community Justice Scotland consider the importance of prevention including questions of housing provision and basic income. Community Justice for Women? A view from 2017. Josee Scott, Freedom Unlimited Enterprises, on the importance of jobs for people with convictions. Breaking the cycle of re-offending through social enterprise. Fiona Jamieson reports on two new community initiatives for women with convictions. The power of creavity through making songs is explored by Alison Urie of Vox Liminis. Caroline Johnstone of the Scottish Prison Service on changes to custodial provision for women in Scotland. A New Vision for Women in Custody. Laura Mulcahy and Nancy Loucks audit the recommendations of the Angiolini Commission. What has been achieved and what remains to be done? Angiolini Commission: audit of progress. Superintendent Rosie Wright on important changes to the way that Police Scotland responds to mental health calls. 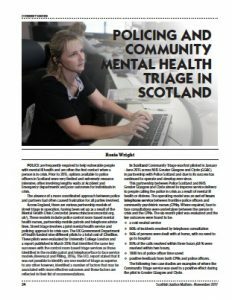 Policing and Mental Health Triage in Scotland. In his first article for publication, Kris MacPherson writes on the power of prison education to support desistance. Rehabilitation and desistance through education? A perfect example of a ‘hook for change’. Kenny Mackay argues that people with learning disabilities are doubly disadvantaged in Scottish criminal justice. Balancing the Scales: what can be done to make the Scottish justice system fairer for people with learning disabilities. A transformed Day in the Life of . . .
A Day in the Life of . . . a client of the 218 Centre, Glasgow. Mary Munro with an update from the previous issue on restorative justice in Scotland. Reporting back: developing restorative justice in Scotland.